With a network of more than 600 professionals from every industry, the mentor program is the crown jewel of 1871. Every day, mentors dedicate their time and expertise guiding our members from issues ranging from legal to tech and everywhere in between, forming valuable relationships and producing concrete outcomes. 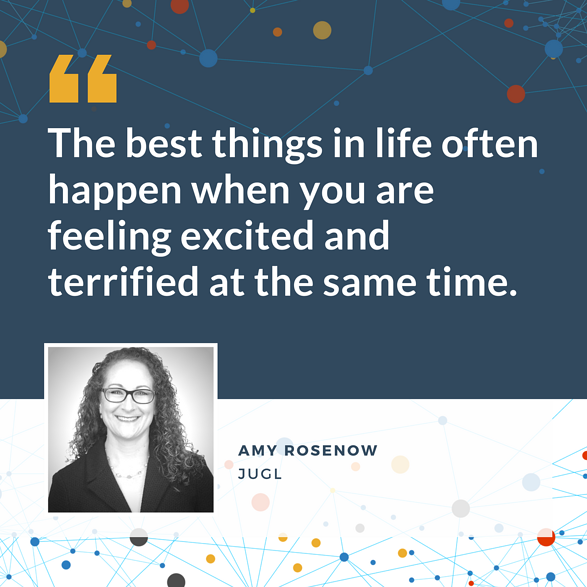 This week, we say hello to Amy Rosenow, the CEO and Co-founder of Jugl. What is one piece of advice you would give to a rising entrepreneur? The best things in life often happen when you are feeling excited and terrified at the same time. Embrace it, take a deep breath when you need to, and in the immortal words of Dory: "just keep swimming." What do you know today that you wish you would have known when you first got started in business? It’s amazing how far you can go in business and in life by simply doing what you said you would do -- when you said you would do it. We will see more women and underrepresented people in tech, and it will be awesome! Do you have pets? If yes, what are they and what are their names? Our goofy chocolate lab named Cinnamon. What is your personal mantra? Those to whom much is given, much is expected. What do you like to do in your free time? Travel, hike, watch live sports and music, and read. What is your favorite comfort food? Breyer's Mint chip ice cream. Follow Amy on Twitter @Amy_Rosenow and connect with her on LinkedIn. Are you interested in becoming a mentor or teaching a workshop at 1871? Learn more here.